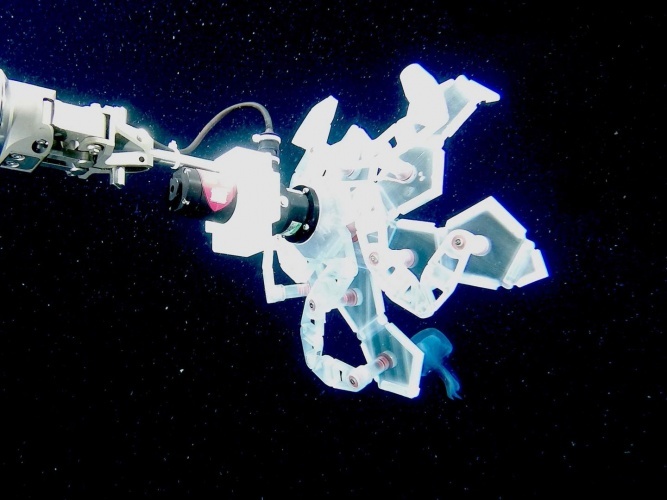 US researchers have created an origami-inspired device for gently capturing delicate sea creatures to study and return to the ocean. RAD (rotary actuated dodecahedron), was developed by a team from Harvard University’s Wyss Institute for Biologically Inspired Engineering, John A Paulson School of Engineering and Applied Sciences (SEAS), Radcliffe Institute for Advanced Study, and the City University of New York’s Baruch College. It is designed for midwater interaction using rotary-actuated folding polyhedrons to quickly and safely capture marine organisms such as jellyfish and octopuses. The device, described in Science Robotics, consists of five identical 3D-printed polymer “petals” that are attached to a series of rotating joints that link together to form a scaffold. The structure rotates at its joints and folds up into a hollow dodecahedron when a single motor applies a torque at the petals’ meeting point. Zhi Ern Teoh, a former Wyss Postdoctoral Fellow, got the idea to apply folding properties to underwater sample collection in 2014. “I was building microrobots by hand in graduate school, which was very painstaking and tedious work, and I wondered if there was a way to fold a flat surface into a three-dimensional shape using a motor instead,” he said. The team is currently working on a more rugged version of the device, while also adding further capabilities. “We’d like to add cameras and sensors to the sampler so that, in the future, we can capture an animal, collect lots of data about it like its size, material properties, and even its genome, and then let it go, almost like an underwater medical check-up,” said Gruber. What an exquisite piece of engineering ! – it nice to see delicate creatures being handled with care and respect, maybe there is hope for humanity after all!. Very cleverly done and probably worthy also as an ‘art installation’.